As previously noted, by way of celebrating the 150th anniversary of the German designer, architect, artist, educator, etc, etc Peter Behrens, three museums in the German state of Nordrhein-Westfalen, NRW, have combined forces to realise a triumvirate of exhibitions exploring the numerous and varied aspects of the man, his work and his legacy: #all-rounder at the MAK Cologne taking a broad look at the breadth of his work between 1894 and 1914; Technology and Art at the LVR-Industriemuseum Oberhausen which explores his architecture and interior design work, and The Practical and the Ideal at the Kaiser Wilhelm Museum Krefeld. 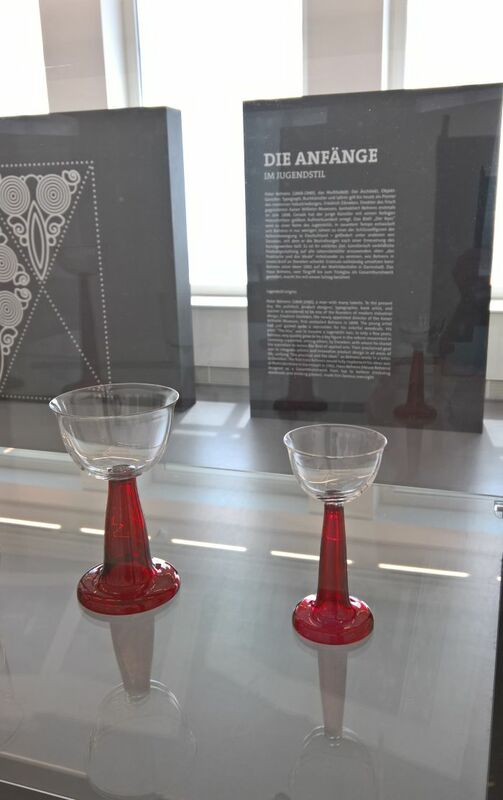 In many regards two exhibitions in one, The Practical and the Ideal opens with an exploration of Behrens’ applied art works, an exploration focusing (principally) on the period 1900 to 1912 and thus the period when that applied art increasingly became industrial art. 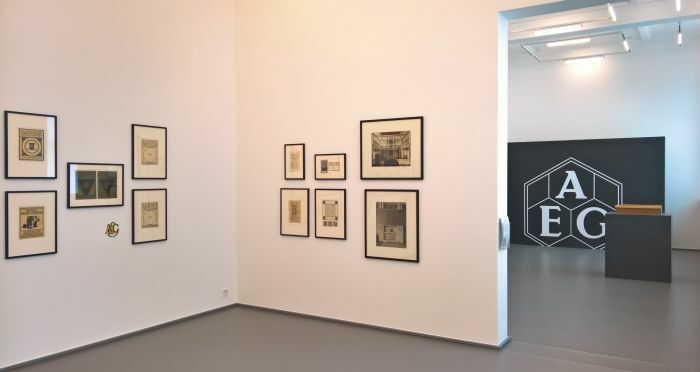 By necessity a graphic heavy exhibition, it’s essentially concerned with graphic works, the showcase presents some 250 objects covering Behrens’ numerous forays into book, font, textile, interior and graphic design, including a focus on his cooperations with the Anker linoleum work in Delmenhorst for whom he not only created linoleum designs and exhibition architecture but also developed what would become corporate identity, and how he then further developed that early experience into his much more famous work for and with AEG Berlin. Complementing and extending the presentation of Behrens’ applied art work are examples of his art art from the period, thereby enabling a presentation concept which allows for the realisation of not only a very succinct and accessible introduction to Behrens 2D creativity, but how that evolved over the course of the decade and a bit, and also how, as Fabian Peters notes,2 Behrens’ early book design work, essentially pure art, fundamentally informed his earliest applied art works, how he transposed designs from his book work to other genres such as glass, textile and metalwork. Not always with success, but through that process Behrens learned what it meant to design for industry. How, and for all where, he learned such is explained in the second part of the exhibition. Parallel to Behrens’ work per se the second focus of The Practical and the Ideal is an exchange of letters between Behrens and Friedrich Deneken undertaken between the years 1898 and 1912; and thereby from a period when not only Behrens was moving ever more towards industrial design, but from a period when understandings of form and aesthetics were changing and the nature of production was being fundamentally reformed. And letters which thus provide a brief glimpse into this process of reform. Or perhaps better put provide a brief glimpse of how the two protagonists Peter Behrens and Friedrich Deneken understood and approached this process of reform, and for all how the exchange of ideas helped Peter Behrens develop and evolve. 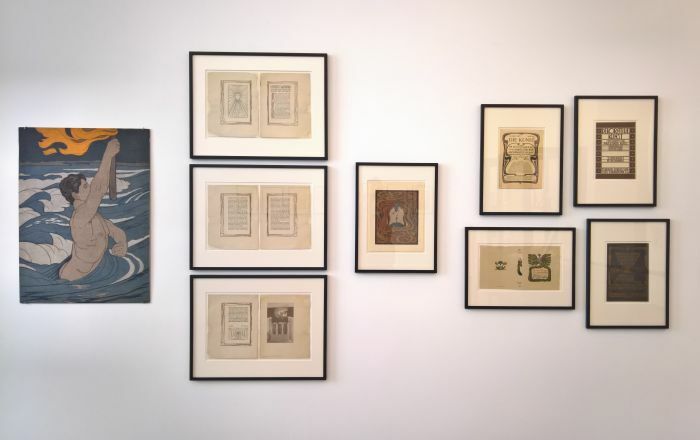 Presenting an exchange of letters in a museal context comes with its own challenges: not just that simply hanging them on the wall for visitors to read quickly becomes monotonous, but where the objects concerned are over a century old and handwritten, such isn’t even an option. Particularly satisfying about the Krefeld decision to discuss the letters in the booklets is that it gives you time to reflect on them, in your own time and at your own leisure. You aren’t compelled to attempt to understand the letters or the relevance of their contents immediately; rather, can take your time, go back, reflect, cross reference with alternative sources and then continue. The letters aren’t printed in full but rather discussed with copious quotes; if we understood things correctly, which as ever with us is not necessarily the case, then the museum are working towards releasing the letters in a critical, academic publication, until then the passages selected by Fabian Peters and Magdalena Holzhey are most illuminating. In 1897 Friedrich Deneken took up his position in Krefeld with the aim of conciling art and craft with industry to both help stimulate the production of objects more relevant for the coming age and also help local industries reform and adapt to and for industrialisation. A task for which he needed not only the cooperation of industry but also of artists. 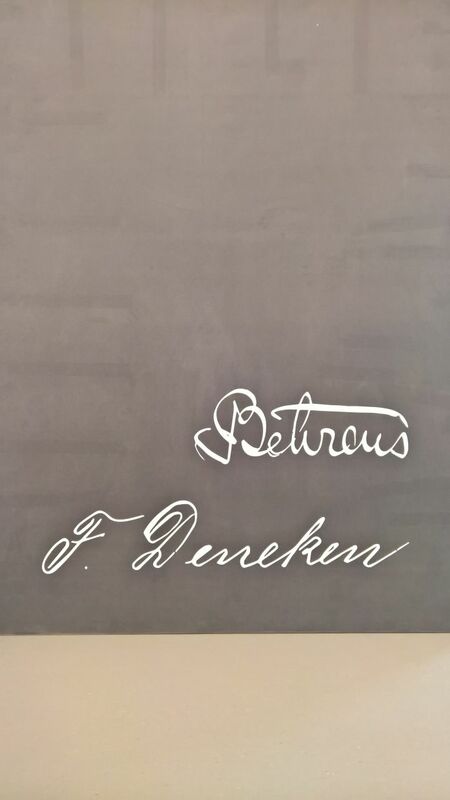 The contact between Friedrich Deneken and Peter Behrens was mediated by the art historian and author Julius Meier-Graefe, one of the arch-protagonists of Art Nouveau Meier-Graefe was closely involved with the influential magazines Dekorative Kunst and Pan, and was also an important facilitator, today we’d probably refer to him as a Networker, bringing together not only, as previously noted, Henry van de Velde with Siegfried Bing, but Behrens with Deneken. On Meier-Graefe’s recommendation Deneken wrote to the still, relatively, unknown Behrens on May 4th 1898 with, in essence, two questions, two questions which would prove important for Behrens’ further career: would he be interested in participating in an exhibition at the Kaiser Wilhelm Museum Krefeld? And would he be interested in submitting designs to be used by the Krefeld silk industry? He was. And he was. Although in terms of the exhibition the request was “only” for woodcuts to be used as decoration in an exhibition of “artistic furniture and appliances”, it was the first of numerous exhibitions in Krefeld to which Behrens contributed, exhibitions which provided a welcome platform for the developing designer. And while the patterns Behrens sent for the Krefeld silk industry weren’t realised, they were amongst Behrens’ first attempts at designing for industry. And Friedrich Deneken had plenty more contacts he could and did broker, including cooperations with the Krefeld glass, iron, textile, furniture and book industries. Again here the majority of Behrens’ designs weren’t realised, neither was the so-called “Krefeld Room” conceived by the pair for Behrens’ house in the Mathildenhöhe Artist Colony Darmstadt, a Damenzimmer furnished (almost) exclusively by works from Krefeld manufacturers; however, and based on those fragments of the letters with which we are familiar, those early commissions brokered through Deneken, and for all the exchange of ideas between Behrens and Deneken, including technical/practical advice from Deneken regarding the realisation of industrial objects, were important in helping Behrens find his feet as a designer for industry and played an important role in what became his house in Darmstadt and his breakthrough. 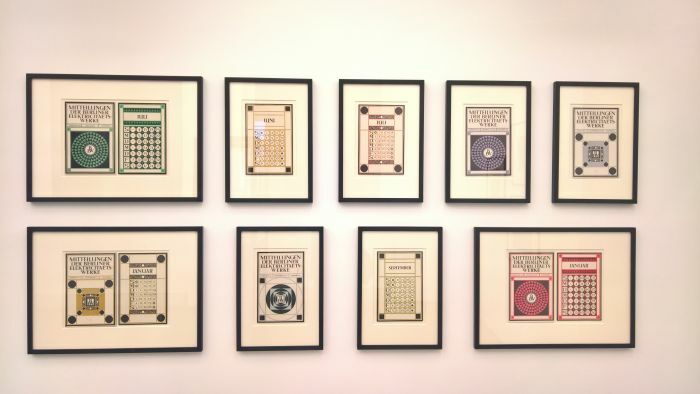 “Through my exhibition in Darmstadt I have just stepped into the foreground of some of the leading figures and would now like to do everything in my power to present a business card again next year”,4 wrote Behrens to Deneken in late 1901. Deneken obliged in facilitating a commission for Behrens to design the stand for the Krefeld Verein für Bucharbeit at the 1902 Düsseldorf Industrie- und Gewerbeausstellung and later a garden with restaurant for the 1904 Düsseldorf Garden Exhibition, the former bringing Peter Behrens to the attention of a specialist public, the later to a much wider public public. And both helping Behrens present his understanding of contemporary, rational architecture and design. In addition Deneken acted as a Networker to Behrens, much as Julius Meier-Graefe did to Deneken, perhaps most notably helping Behrens in his search for a new architecture professor for the Kunstgewerbeschule in Düsseldorf, a post Behrens had clearly decided had to be filled by a Dutch architect, but for which he needed advice both on whom to ask, and for all how to approach them, noting to Deneken, “you know just as well as I do how terribly reserved and awkward the Dutch are…”5 Following an exchange of views the position was awarded to Johannes Lauweriks, a decision that also means today we have the curious wonder of Lauweriks’ contributions to Karl Ernst Osthaus’s Hohenhagen Garden City project in Hagen, in all their ridiculous, delightful, fairy grotto, rational, romantic, obtuse, Gothic, monumental absurdity. Whereby, now that we have mentioned Hagen……. ….. the word Hagen doesn’t appear in the two booklets. Or, and unless we missed it, which is always possible, anywhere in The Practical and the Ideal. And that despite the fact that in the later half of the period covered by the exhibition and the exchange of letters, Behrens was also active for industry in Hagen. In how far there existed a competitive position between Friedrich Deneken in Krefeld and Karl Ernst Osthaus in Hagen and their attempts to advance their local industries, thereby making it a taboo subject between Behrens and Deneken, is something that a detailed analysis of the letters may allude to. But if inter-community rivalries in NRW were half as intense then as they are today, it wouldn’t surprise us. Following Behrens 1907 move to Berlin and AEG the correspondence between the pair became more sporadic, not least because as Magdalena Holzhey notes,6 while Behrens drifted ever more towards industrial production, Deneken remained strongly craft orientated, a difference which neatly reflects and underscores one of the principle debates of the period, if you will one of the main controversies in the early decades of the 20th century, certainly discussions which were important in the development of what became international modernism, and again something one would hope a more detailed analysis of the letters will allow a deeper insight into. As it is they, or at least the extracts currently available, provide for a new perspective on how Peter Behrens moved from art to applied art to design, of the importance of Friedrich Deneken in that procss and thereby extend and expand the popular Behrens’ biography and allow for a fuller, more honest, picture of Behrens the man and Behrens the creative, and for all of how he strove the link the Practical to the Ideal. Peter Behrens. 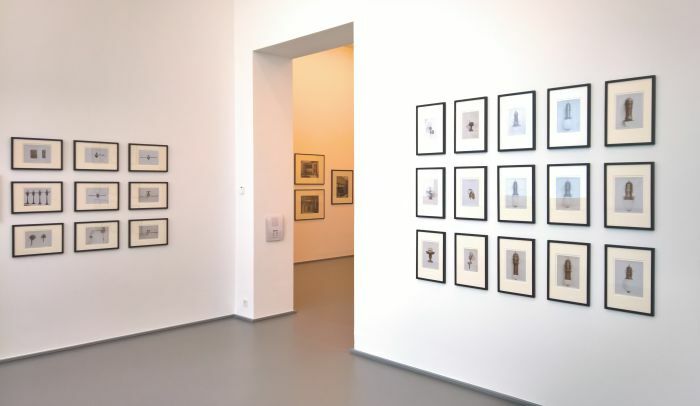 The Practical and the Ideal runs at the Kaiser Wilhelm Museum, Joseph Beuys-Platz 1, (ehemals Karlsplatz 35), 47798 Krefeld until Sunday October 14th.